The “college admission scandal” cases are complicated, and the pleadings are voluminous and more are being filed every day. I’ll try to summarize it all as accurately as possible: caution, though, that I am not offering any legal advice nor opinions, and defendants are innocent until proven guilty. The US Attorney for Massachusetts has charged thirty three parents in two cases. 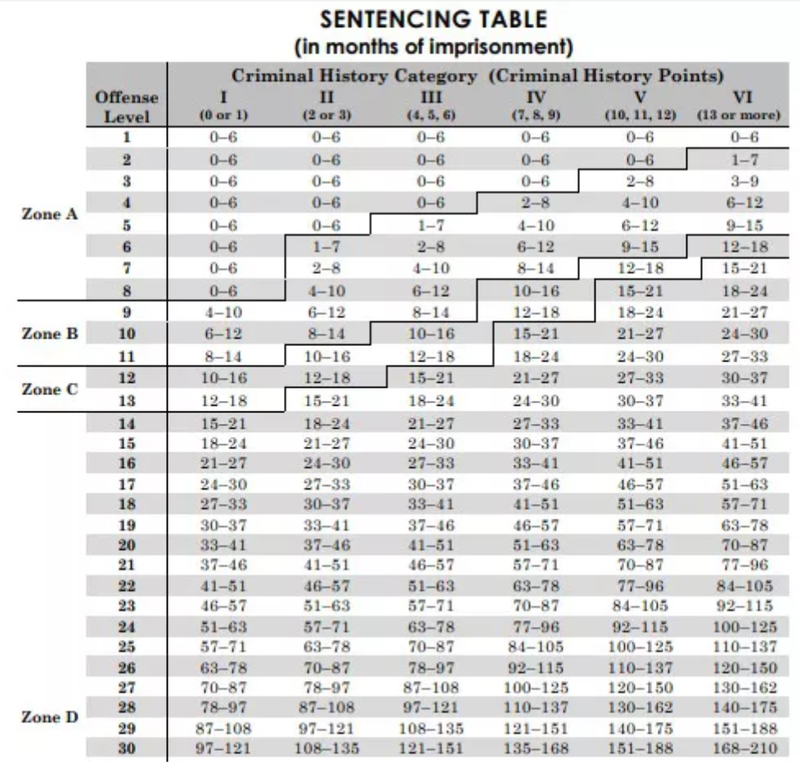 Based solely on the offense levels, and if all defendants are in criminal history category I (the first column), then one defendant falls within Zone A, five fall in Zone B, two fall in Zone C, and three fall in Zone D.
What did the plea agreements provide for? A few examples are warranted. A husband and wife (the “Abbotts”) fell into offense level 13. The allegations are that they paid a total of $125,000 to have their daughter’s ACT and SAT test scores manipulated. That amount fell into the $95,000 to $150,000 range, which added 8 to the base level of 7, for a total of 15. Because that total (15) was below 16, they received credit of 2 for accepting responsibility. Their plea agreements are recommending to the court that they receive prison sentences of 12 months each, serve 12 months of supervised release, each pay $55,000 in fines, and pay restitution in an amount to be determined. The actress Felicity Huffmann fell into offense level 9. The allegations are she paid “at least $15,000” to have her daughter’s SAR test scores manipulated. That amount – at least $15,000 – added 4 levels to her offense level (as opposed to adding 2 for $6,5000 to $15,000). 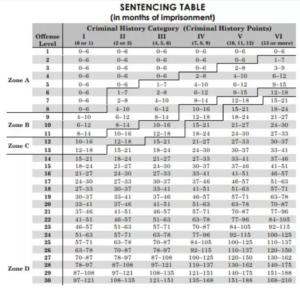 In a separate case, a second superseding indictment filed on April 9, 2019, nineteen defendants have been charged with two counts each: conspiracy to commit mail and wire fraud and honest services, mail and wire fraud under 18 USC 1349 (as charged in the other indictment) and money laundering conspiracy under 18 USC 1956(h). Both the original criminal complaint and the second superseding indictment provide some detail on the money laundering “conspiracies”. I put “conspiracies” in quotes because there were no elaborate schemes to hide the origins of the payments, nor to really mask the identities of the recipients of the payments. Very simply, checks were written to a university or college sports department c/o the bribed official, or checks or wire transfers were made to a charitable organization operated by Rick Singer. The Government is alleging, and hopes to prove, that these simple transactions satisfy the elements of money laundering conspiracy. At least the Government will not have to unravel complex financial transactions involving multiple shell companies and payments mechanisms. Eleven mothers and fathers have entered into plea agreements relating to a federal criminal charge of conspiracy to commit mail and wire fraud; nineteen more have been been charged with conspiracy to commit mail and wire fraud, and money laundering conspiracy. Ten of the eleven that have entered plea agreements have agreed to recommended federal prison sentences of between four and fifteen months; the eleventh has agreed to a recommended sentence of zero to six months. All eleven have agreed to fines ranging from $9,500 to $95,000, as well as restitution (to whom?) in amounts to be determined. In both indictments, the Government has brought forfeiture (18 USC 981(a)(1)) and money laundering forfeiture (18 USC 982(a)(1)) charges against the defendants. Global Money Laundering Estimate – Time for An Update! Other reports use statements like “over $1 trillion is laundered globally every year, and less than one per cent is seized.” A recent article posted on LinkedIn confidently stated that “IMF indicates that every year, up to 2 trillion USD is laundered through financial systems globally.” Where do these numbers come from? Are they accurate? Even if they’re not accurate, can they be useful, if used responsibly? The first question can be answered simply: those numbers/estimates probably come from their authors having read about, but probably not reading, a United Nations Office of Drug Control report (not an IMF report) issued in October 2011 titled “Estimating illicit financial flows resulting from drug trafficking and other transnational organized crimes.” The report is available at https://www.unodc.org/documents/data-and-analysis/Studies/Illicit_financial_flows_2011_web.pdf. As to the second question: are the numbers accurate? The authors of the UNODC report warn in the preface of the report that “the final monetary estimates are to be treated with caution. Further research and more systematic collection of data on this topic are clearly required.” And the various estimates of total criminal proceeds, criminal proceeds available for laundering, and transnational criminal organization proceeds laundered through the financial system, are all given in broad ranges. And the estimate of the amount seized by law enforcement – “less than one per cent” – is both accurate and inaccurate: the report actually provides that “globally, it appears that much less than 1% (probably around 0.2%) of the proceeds of crime laundered via the financial system are seized and frozen”. So yes, 0.2% is “less than 1%”, but it isn’t an impressive number either way. The report refers to a number of earlier reports, but four deserve a mention. The first was a paper written by John Walker: “Estimates of the Extent of Money Laundering in and through Australia” (1995). The second was a 1998 IMF report that provided a “consensus range” of the total amount of criminal proceeds as 2% to 5% of global GDP. The third was a paper written by a British academic, Brigette Unger, “The Scale and Impact of Money Laundering”. The fourth was a paper written by the aforesaid Walker and Unger, “Measuring Global Money Laundering: The Walker Gravity Model” (2009). Note that with the 2011 UNODC report, there has been nothing of consequence in almost eight years. “‘Always follow the money’ has been sound advice in law enforcement and political circles for decades. Nevertheless, tracking the flows of illicit funds generated by drug trafficking and organized crime and analysing the magnitude and the extent to which these are laundered through the world’s financial systems remain daunting tasks … As with all such reports, however, the final monetary estimates are to be treated with caution. Further research and more systematic collection of data on this topic are clearly required. Prior to this report, perhaps the most widely quoted figure for the extent of money-laundering was the IMF’s ‘consensus range’ of between 2-5 per cent of global GDP, made public in 1998. A study-of-studies, or meta analysis, conducted for this report, suggests that all criminal proceeds are likely to have amounted to some 3.6 per cent of GDP (2.3 – 5.5 per cent) or around US$2.1 trillion in 2009. The resulting best estimate of the amounts available for money-laundering would be within the IMF’s original ‘consensus range’, equivalent to some 2.7 per cent of global GDP (2.1 – 4 per cent) or US$1.6 trillion in 2009. From this figure, money flows related to transnational organized crime activities represent the equivalent of some 1.5 per cent of global GDP, 70 per cent of which would have been available for laundering through the financial system. What about this now-accepted “consensus range” for the extent of money laundering of between 2% and 5% of global GDP? Page 9 offers an interesting observation on that consensus range: “The data suggest that the best estimates are situated at the lower end of the range. But this is to some extent a question of methodology. If tax- and customs-related money-laundering activities were included in the calculation, results would move towards – and perhaps exceed – the upper end of the ‘consensus range’. On the other hand, if only transnational crime-related proceeds were considered, the available estimates for laundering would fall to levels around 1% of GDP, and thus below the ‘consensus range’.” Note that global GDP is ~$75 trillion. The result? It remains fair to say that one trillion dollars is laundered every year, most of that flows through the global financial system, and less than one-quarter of one per cent of the proceeds of crime laundered via the financial system is seized and frozen. We must do better. Illegal cannabis grows, shell companies, straw buyers, border searches, beneficial owners … and GTOs? On March 7th the US Attorney for the Central District of California announced the arrests of three men for running an illegal marijuana grow and distribution operation out of eight homes in San Bernardino County. This case reads like an ACAMS or ACFCS exam question, with even dollar wires from China, cash purchases of homes by straw buyers, linked shell companies, false leases, even border searches of cell phones (yes, when you enter the United States the Government can not only search your luggage, it can search your cell phone and laptop). You may be asking yourself – if the homes were purchased with “all cash”, were they covered under FinCEN’s real estate-related Geographic Targeting Orders (GTOs)? The four GTOs require title insurance companies to report all cash purchases by legal entities of residential real estate over $300,000 in certain markets. The original January 2016 GTO affected only Miami and New York (and properties over $1 million in Miami and $3 million in New York). The GTO was renewed and expanded in July 2016 to cover LA County (properties over $2 million), and in November 2018 the GTO was expanded to twelve cities/counties and in all twelve the purchase price was set at $300,000. Were any of these properties covered by the GTOs? No. San Bernardino County isn’t covered, and all eight properties were originally purchased by individuals. Even if San Bernardino County was covered, the four that were transferred to LLCs were all in amounts below the $2 million threshold and before the threshold was reduced to $300,000 in November 2018. What if real estate agents had BSA/AML reporting requirements? Would the real estate agents in these deals recognized any red flags? No. 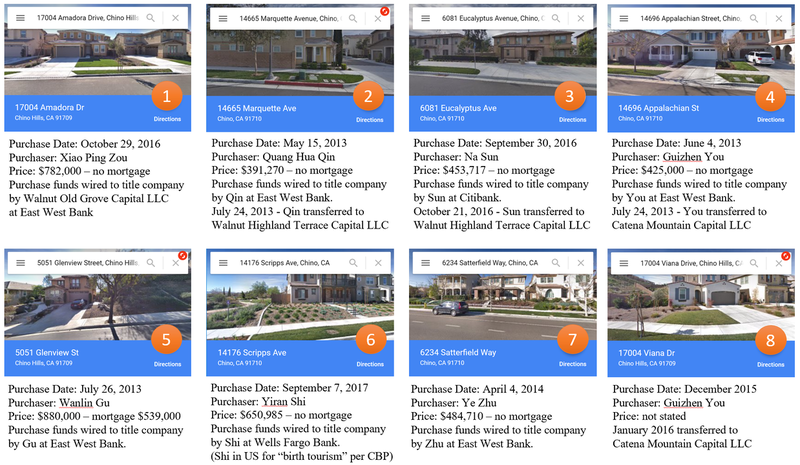 One real estate agent handled all eight transactions: he is the lead defendant and set up the straw buyers, shell companies, etc. The press release included the following quote from United States Attorney Nick Hanna: “In states that have decriminalized marijuana, we have seen an influx of foreign money used to establish grow operations, with much of the marijuana being destined for out-of-state consumers”. But seven of the eight properties used as grow houses were purchased before California passed the November 2016 proposition approving adult-use cannabis, and seven of the eight were set up as grow operations before the adult-use cannabis regime began in January 2018. However, there may be a connection to the adult-use cannabis regime: the first grow operation began in November 2016, then the next six were set up between August and October 2017. It appears that the defendant Li (through his wife) bought a house in September 2016 and immediately converted it to a grow operation (house #3 above). 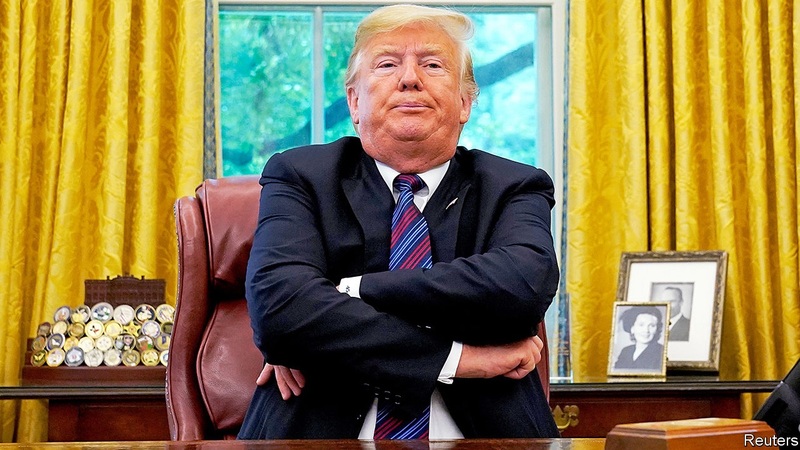 Once that was running, he then took six houses that had been purchased by Chinese nationals between 2013 and 2015, perhaps as investments and as means to get funds out of China and that were sitting empty, and converted them to grow operations. A Chinese national with an account in a US bank received four incoming wires from her account at a Hong Kong bank within six days for $120,000.00, $110,000.00, $120,000.00, and $100,000.00 followed two days later by a wire transfer for $445,000.000 to a title company. A careful review of the LLCs shows that there are common addresses (including mail drops at UPS Stores), and common managers, agents for service of process, and officers. However, all of the activity occurred prior to May 11, 2018, so the beneficial ownership rule was not yet in force. Tall, Dark and Handsome – Words and Punctuation Matter! Is Transaction Monitoring a Thing of the Past? Team Members – or employees … as opposed to … Team Mates – those who report to you, who you report to. Where you sit in an organization has a big influence on how you see the organization and your job. Middle Management – again, however this is defined in your organization, this is where a lot of tone deaf people reside. A G30 report from a few years ago on financial institutions and risk management referred to middle management as “the Blocking Middle”. We’ve all seen that. These stakeholders all have their own interests and perspectives. You can balance different perspectives, but you need to juggle competing interests, and even choose one or more stakeholders over others. Good risk management brings these views together as different perspectives, and balances the interests of stakeholders: bad risk management treats them as competing interests, and ignores the interests of stakeholders. Ask yourself in each situation … which stakeholders’ interests are you preferring over others? How are you communicating with those stakeholders? But realizing you’ve got 20 or more “Cooks in the Kitchen” is helpful as you think about decisions you need to make. Tools – do you and your teams have the right tools to use that data? By the way, this is where machine learning and AI come in … without good relationships, great data, and better technology, investing in ML and AI is like buying a high speed train without having the tracks to run it on. People – the number of people is the LAST consideration you should have when it comes to people. Your first concerns are: (1) are they well led? (2) are they well placed in the organization? (3) are they well “fed” (compensation, benefits, opportunities)? And 4th and finally … Do you have enough of them? Although People are the last resource to consider, they are your most precious resource! Which direction am I best at managing? Why? Which direction am I worst at managing? Why? Which direction do I like the best? Why? Which direction(s) do I dread the most? Why? Which direction(s) do I avoid dealing with? Why? You’ll probably never be in balance … so find and embrace your equilibrium. Machine Learning has its place in financial crimes, and has had a place in financial crimes since at least 2010: it’s just that the hype and marketing around it is hitting the mainstream. And unless and until FinTech can bring intuition, empathy, judgment, common sense, and courage into the financial crimes environment, us humans will always have the most important role and machines will remain tools, not solutions. There are no technology solutions. Only tools. Humans behaving well, and with good technology and better data, provide solutions. Capable – in anything. It doesn’t have to be financial services. Military veterans are great examples of people that can make great analysts without any financial services background because they are invariably capable people. Curious – this is one of the big qualities. As I’ve said, I’ve directly or indirectly hired thousands of AML analysts over the years … and was one myself. If there is any attribute that separates a good analyst from a great analyst it is an insatiable curiosity to learn more, turn one more corner, to think differently about a problem. An analyst/investigator needs to have all 7 attributes in order to look for, find, and explain (1) what is there that should be there, (2) what is there that shouldn’t be there, (2) what is not there that should not be there, and (4) what is not there that should be there. Tall, Dark, and Handsome – Words (especially adjectives and adverbs) and punctuation matter! This is a good example of a poorly written sentence that is begging for clarity. The phrase “almost all” means very little: at least 51% and less than 100%. Second, do “almost all” drugs come from overseas, or do almost all Americans come from overseas? And finally, Mexico is the source country for 90% – 94% of heroin entering the US, and the final transit country for 90% of the cocaine entering the US. Mexico isn’t actually overseas from the US. Most modifiers are unnecessary. Whether necessary or not, as a risk professional you should be very aware of both your use of adjectives and adverbs, and when reading others’ use of adjectives and adverbs. When confronted with any modifier, ask yourself (i) why is that modifier being used? (ii) is it being used correctly? (iii) does it change the meaning of the sentence in a way that is unintended? (iv) is it being used consistently with other modifiers? And (v) could it limit or prevent us in the future? years of experience (and not just one year of experience many times over, but many years of experience). The true Expert doesn’t see herself as an expert, will rarely call herself an expert, probably doesn’t see herself as an expert, but she possesses those traits, or enough of them, to truly be, and be seen as, a Subject Matter Expert. thinks of himself as possessing enough of as many of the traits needed to pass himself off as an Expert. The Enthusiast overcomes his lack of true expertise with just enough confidence, hubris, and (frankly) enthusiasm to move a project ahead or design a monitoring system just long enough to allow auditors, regulators, and prosecutors to catch up … and then for the true experts to bail him (and the project or monitoring system) out. What’s the trick? Understanding where your expertise ends and your enthusiasm begins … understanding who are the experts and who are the enthusiasts, having the right blend of experts and enthusiasts … and taking the best of both, bringing them together, and building a highly effective team. Twenty years ago we had moved away from Transaction Monitoring. Now, in full disclosure we kept a TM system running, and it spit out alerts that we had to deal with. But it was our least efficient, least effective, and one of the smallest sources of alerts we had at all banks I worked at. If TM hasn’t been dead for 20 years, it’s been on life support. After the September 2001 terrorist attacks, the 9/11 Commission was set up to look at what happened, and why. In its final report issued in 2004, they concluded that the US government’s failures could be grouped into four major categories: failure of policy, failure of capabilities, failure of management, and failure of imagination. And they concluded that the “most important failure” was a lack of imagination. I believe that all four of those failures – of policy, of capabilities, of management, and of imagination – have one thing in common. A failure of courage. What do I mean by courage? Grave Danger, Critical Habitats, and Oxford Commas – Words and Punctuation Matter! Words and punctuation matter! Be precise in, and be careful with, the words you speak and write, and the words you’re hearing and reading. There is much attention being placed on machine learning and artificial intelligence, both of which require computer coding that is precise. We must have the same attention paid to precise language and precise punctuation. Let me give you a few examples. In the First Circuit Court of Appeals case of O’Connor et al v Oakhurst Dairy et al, 1st Cir. CA 16CV1901 (March 13, 2017), the Court wrote a 29-page decision on whether “packing for shipment or distribution” meant “packing for shipment” and the separate activity of “distribution”. The drivers of a Portland, Maine dairy company, Oakhurst Dairy, were suing to recover $10 million in overtime pay. They argued that driving, or distribution, was not covered by a Maine law that sought to exempt certain activity in the perishable foods industries from overtime pay. That law required overtime pay except for “the canning, processing, preserving, freezing, drying, marketing, storing, packing for shipment or distribution of” certain products, including dairy products. The drivers argued that “packaging for shipment or distribution” didn’t include “distribution”. The Court of Appeals agreed and remanded the case back for a determination of the amount of overtime owed. In February 2019 the parties settled on $5 million. The Oakhurst Dairy case is also known as the “Oxford Comma” case because it deals with a punctuation style for serial lists of like items that is espoused by the Oxford University Press (apparently with strong opposition from the Associated Press). The decision, which is 29 pages long and begins with “[F]or want of a comma, we have this case”, includes an interesting footnote on page 16. There, the Court notes that Maine’s Legislative Drafting Manual provides “when drafting Maine law or rules, don’t use a comma between the penultimate and the last item of a series.” So the law as written followed Maine’s drafting style. But the Court noted that Maine is one of only seven states to conform to that style, and both the House and Senate follow the “Oxford comma” style (both the House and Senate have an Office of Legislative Counsel and Manual on Drafting Style and Legislative Drafting Manual, respectively. This is a good example of a poorly written sentence that is begging for clarity. The phrase “almost all” means very little: at least 51% and less than 100%. Second, do “almost all” drugs come from overseas, or do almost all Americans come from overseas? And finally, Mexico is the source country for 90% – 94% of heroin entering the US, and the final transit country for 90% of the cocaine entering the US. I checked on a map, and Mexico isn’t actually overseas from the US. (any more than Canada was the first overseas country visited by First Lady Melania Trump). In addition to punctuation and grammar, pay attention to modifiers – adjectives and adverbs. In Weyerhaeuser v. US Fish & Wildlife Service, (USSC 17-71, slip opinion November 27, 2018), the US Supreme Court had the occasion to discuss adjectives at some length as they decided whether the phrase “critical habitat” required any habitability. In a unanimous opinion written by Chief Justice Roberts, the Court wrote (at page 8): “Our analysis starts with the phrase “critical habitat.” According to the ordinary understanding of how adjectives work, ‘critical habitat’ must also be ‘habitat.’ Adjectives modify nouns—they pick out a subset of a category that possesses a certain quality. It follows that ‘critical habitat’ is the subset of ‘habitat’ that is ‘critical’ to the conservation of an endangered species.” See https://www.supremecourt.gov/opinions/18pdf/17-71_omjp.pdf accessed December 6, 2018. This case reminded me of advice I received as a young barrister in Canada in the late 1980s. My mentor – a Queen’s Counsel who later became a judge – taught me to always pay attention to modifiers: adjectives and adverbs. Remember the movie “A Few Good Men” starring Tom Cruise and Jack Nicholson? Colonel Jessup (Jack Nicholson) was on the witness stand being cross-examined by Lieutenant McCaffrey (Tom Cruise). Lieutenant McCaffrey asked “were the men in danger? Grave danger?” And Colonel Jessup replied in “is there any other kind?” A great line! Most modifiers are unnecessary, and many are redundant (e.g., end result, first began, twelve noon, and revert back). Whether necessary or not, when writing in a business setting you should be very aware of both your use of adjectives and adverbs, and when reading others’ use of adjectives and adverbs. When confronted with any modifier, ask yourself (i) why is that modifier being used? (ii) is it being used correctly? (iii) does it change the meaning of the sentence in a way that is unintended? (iv) is it being used consistently with other modifiers? And (v) could it limit or prevent us in the future? The modifiers “necessarily” and “automatically” are important: the agencies did not write that “pilot programs that expose gaps in a BSA/AML compliance program will not result in supervisory action with respect to that program” or “the Agencies will not assume that the banks’ existing processes are deficient”. They left the door (wide) open for taking regulatory action against institutions where innovative pilot programs reveal gaps in their existing anti-money laundering programs. Intended, as in “this product is intended to be sold only to medium-sized businesses”. When read critically, this phrase also means “although this product is intended to be sold only to medium-sized businesses, there are no controls stopping us from selling it to whatever customer class we want …”. Intent is only that: intent. And make sure you understand words and phrases that are now commonly used but may not be commonly understood. Examples include “machine learning” and “artificial intelligence” – honestly now, do you really know what those things mean? And then there’s vague words such as “implement” (which I see all the time in Action Plans), “solution” (most solutions are simply tools), “agile development” (caution – that can mean lack of testing), and my favorite: “paradigm shift”. It is important to be aware of how you and others use punctuation, adjectives, and adverbs. If not, your career could be in danger. Grave danger. With an average of 55,000 new financial institution filings each day — known as Currency Transaction Reports (CTRs) and Suspicious Activity Reports (SARs) — the Financial Crimes Enforcement Network, (FinCEN) is busy. FinCEN, a bureau within the U.S. Department of the Treasury’s Office of Terrorism and Financial Intelligence (TFI), is the arm of our government charged with safeguarding the financial system from illicit use, combating money laundering, and promoting national security. Those CTRs and SARs are filed by individual institutions acting alone and, for the most part, are the result of each institution monitoring its own customers’ cash and other transactions and reporting large cash transactions and suspicious transactions. But since the passage of the USA PATRIOT Act, a law enacted in response to the 9/11 terrorist attacks, there have been provisions to allow for the sharing of information between the government and financial institutions, and amongst financial institutions. These provisions – contained in section 314(a) and 314(b) of Patriot Act, authorize FinCEN to share law enforcement and regulatory information with financial institutions (FIs) on individuals, entities, and organizations reasonably suspected of engaging in terrorist financing or money laundering activities, and vice versa. 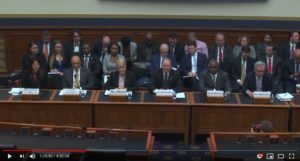 “The notion of information sharing was there before the PATRIOT Act, but no one had an appetite for it without any statutory protections,” said Jim Richards, Founder of RegTech Consulting, and former Bank Secrecy Act (BSA) Officer and Global Head of Financial Crimes at Well Fargo & Co.
Richards says this is an incredibly powerful tool that has been on the books for more than 15 years; and, when used properly, has provided valuable data to disrupt money laundering and terrorist financing. But, as with anything, Richards believes there are some improvements to be made. “There are ways we can utilize these tools to be more efficient and more effective for banks and law enforcement,” he said, adding that this includes combining parts of the law together in a smarter way. Section 314 (a) and 314 (b): What’s the Difference? But first, a crash course on sections 314(a) and 314(b). Section 314(a): Mandatory Information Sharing between Law Enforcement and Financial Institutions — This subsection deals specifically with information sharing between law enforcement via FinCEN and FIs. Law enforcement agencies investigating a crime related to terrorism or money laundering, via a FinCEN request, can ask FIs to search their records to determine whether they maintain or had maintained accounts for, or engaged in transactions with, any “individuals, entities, and organizations reasonably suspected of engaging in terrorist acts or money laundering activities.” Essentially, FinCEN is the gatekeeper for all information requests. Section 314(b): Voluntary Information Sharing Between FIs — Here, two or more FIs and any association of financial institutions (emphasis added, don’t worry, we will get back to that), may share information with one another “regarding individuals, entities, organizations, and countries suspected of possible terrorist or money laundering activities.” Simply put, this is an information-sharing mechanism to help disrupt financial fraud crimes by and among those FIs that elect to participate. Keep in mind, Section 314(b) is a voluntary information-sharing tool; FIs are not required to register with FinCEN, nor share information. Section 314(a) activities, however, are mandatory, and FIs must comply with FinCEN information requests. These information requests are limited in scope to terrorism activities (see 18 U.S.C. 2331) and money-laundering activity (see 18 U.S.C. 1956). Powerful stuff, right? “Before the PATRIOT Act, we couldn’t do that,” Richards notes. Powerful, but not without its share of controversy. Let’s say Bank A and Bank B are registered with FinCEN under Section 314(b). Bank A is investigating an account owned by Jim for the purposes of filing a SAR. If Bank A sees that Jim has been sending money to Gina at Bank B, Bank A can request that Bank B provide transaction information. In Congressional testimony earlier this year, a witness testified that “of the roughly one million SARs filed annually by depository institutions (banks and credit unions), approximately half are filed by only four banks.” What if FinCEN and these four largest financial institutions worked together to share information? And what if they did that with tools already in the anti-money laundering (AML) toolbox? Here’s how. Remember the language we emphasized above in Section 314(b)? Financial institutions and any association of financial institutions? An “association” can be a tremendously powerful tool when coupled with Section 314(a). Richards describes a scenario where these largest FIs get together to form an information sharing association under 314(b), which not only allows them to share certain information but provides legal protections when doing so, and then the association can work proactively with FinCEN and law enforcement to receive and send names of known targets under 314(a). 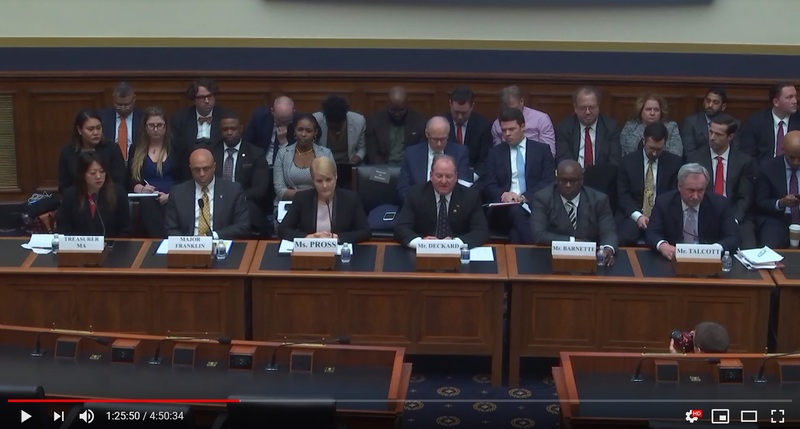 The House Financial Services Committee’s Subcommittee on Consumer Protection and Financial Institutions held a hearing on February 13, 2019 titled “Challenges and Solutions: Access to Banking Services for Cannabis-Related Businesses”. The video of the hearing – available at https://www.youtube.com/watch?time_continue=1547&v=kW7fWM04Uyc ran for a total of 4 hours and 50 minutes, less 26 minutes at the beginning when the hearing was slightly delayed and a one hour and twenty-three minute recess at the 1 hour 40 minute mark (all of this – and the time tags to follow – are for the benefit of those that may choose to watch the video of the hearing!). First, some highlights of the written testimony of the witnesses. “FinCEN Guidance (described below) does provide some assurances that a bank is complying with anti-money laundering rules if it follows the agency’s heightened SAR guidelines. However, without a statutory safe harbor, bankers rationally fear that the politics could shift against cannabis in an instant. It is telling that banks that choose to serve cannabis-related businesses are required to have an exit plan to unwind their loans, a requirement that does not exist for any other category of lending”. One thing that re- or de-scheduling of cannabis and cannabis-related banking reforms could accomplish is to get these unregulated and sometimes less-than-transparent businesses out of the cannabis banking environment completely. That would be a positive for everyone (except those providers of end-run, head-fake payments services). “our organization has come to provide banking services to five hundred Oregon sanctioned cannabis businesses. That makes the cannabis banking program at Maps one of the largest in the United States … In 2017 and 2018 alone, Maps received well over $529 million in cash deposits from cannabis businesses …”. There are roughly 250 business days in a year, so over 500 business days, Maps received, on average, over $1 million in cannabis-related cash deposits from some or all of its 500 cannabis related business members (credit unions don’t have “customers”, they have “members”). That is a lot of cash for a 250 employee, 10-branch credit union in Salem, Oregon. As Ms. Pross correctly pointed out, that is $529 million that was taken off the street and entered the banking system: she and her colleagues at Maps Credit Union should be commended for that. Based on this, and her testimony at 4:21:05, in two years Maps Credit Union filed 11,000 CTRs over approximately 500 business days, or an average of 22 CTRs per day on an average of $1 million in cannabis-related cash deposits (not all of which would have hit the $10,000.01 threshold for filing a CTR). But the SAR testimony is more interesting. Although Ms. Pross verbally testified that “in the past two years we’ve filed nearly 3,000 marijuana-related SARs to FinCEN” and that of the 3,000, “90% related to cannabis businesses” (4:21:05), the written testimony may be more accurate. There, 90.2% of 2,770 is 2,500 SARs. The FinCEN Guidance requires banks and credit unions to file a Marijuana-related SAR every 90 days. So, if Maps has 500 CRB customers – and assuming that they had 500 CRB customers through the course of those two years, that would mean that they should have filed 500 SARs every 90 days, or 4,000 SARs in 2017-2018. They filed 2,500. Ms. Pross may need to provide some detail on the number of CRB customers it had through 2017 and 2018: simply based on this written testimony and the statement that they had 500 CRB customers, the math doesn’t seem to work. Leaving aside whether the California cannabis-related legislation has actually made California safer, I don’t believe the statement “the cartels actually don’t come to California anymore”, whether because of the 1996 and 2016 propositions or not, is an appropriate statement to make. I trust that Treasurer Ma will formally retract that statement – unless, of course, it is true that drug cartels no longer come to California. Update: On February 11, 2019 the Governor of California announced that he was pulling California’s National Guard troops from the southwest border. To effect that he issued General Order 2019-01, which among other things “authorizes up to 100 service members with critical skills to that the California National Guard can focus vital and exclusive support on combating transnational criminal organizations …”. In his state-of-the-state speech that same day, the Governor stated that he was redeploying troops to northern California “to go after illegal cannabis farms, many of which are run by cartels …”. Miss Porter (D. CA) asked Treasurer Ma about California’s cannabis-related tax revenue, and whether the banks that accept that revenue should also be required to provide banking services to cannabis-related businesses. Treasurer Ma replied (4:04:30) that California does business with eight banks, and “marijuana tax proceeds go into one national bank.” I was waiting to hear which national bank that was, but she neither volunteered the information nor was she asked. For those interested, Representative Alexandria Ocasio-Cortez (D. NY) is a member of the Subcommittee and had her five minutes of time (beginning at 4:11:58). Her commentary and questions focused on what she described as the “racial wealth gap”. Mr. Tipton referenced a Denver Post article that referred to a Colorado government report from October 2018. That report from the Colorado Division of Criminal Justice, found that the number of court filings charged with the Colorado Organized Crime Control Act that were linked to one or more cannabis charges had gone from 31 in 2012 to 119 in 2017. Lost in the headline, though, is that the number of COCCA charges linked to marijuana dropped in 2013 to 15, and dropped again to 1 in 2014 before increasing to 40 in 2015, 81 in 2016, and 119 in 2017. Regulatory Lag & Drag – Are There FinTech Solutions? The RegTech, SupTech, and FinTech communities are focused on developing new technologies to speed up, simplify, and streamline financial institutions’ ability to implement new rules, regulations, and regulatory guidance. But there are two other stages of the regulatory life cycle that may be longer and more problematic for financial institutions than implementing new regulations: these are the time it takes for new regulations to be written and published (“Regulatory Lag”), and the time it takes to enforce those regulations (“Regulatory Drag”). Time to Regulate – or “Regulatory Lag”. Public enforcement actions (and prosecutions) drive a lot of compliance-related behavior in financial services. Yet there are multi-year delays between when the impugned behavior occurred and when a public enforcement action (and/or prosecution) makes them known to the industry. FinCEN’s December 2014 action against MoneyGram’s former BSA Officer is a good example: that action was made public in December 2014, and alleged violations of the Bank Secrecy Act that occurred from 2003 through May 2008, or more than 6 ½ years from the last day of the impugned activity and when the public action was taken. What Can Technology Do To Address Regulatory Lag and Drag? Regulatory lag and drag have been around for as long as there have been regulators. But with the world speeding up as much as it is, with new products and services, and new providers, being rolled out and created much faster than regulatory bodies can manage, there must be changes made in the entire regulatory life cycle. FinTech providers and their customers demand a fast revolution. Regulators prefer a slow, deliberate evolution. There has to be a better way to identify new and emerging risks, to draft and communicate regulations to address those risks, and to implement the needed controls to manage those risks. I’m not sure what can be done from a purely technology perspective to speed up regulators (and prosecutors), but the proponents of FinTech, RegTech, and SupTech solutions shouldn’t just focus on digitizing the implementation of new regulations, but on digitizing the entire regulatory life cycle: the regulatory lag between new risks and new regulations, the regulations themselves, and the regulatory drag from regulatory problem to public resolution. To understand the current broo-haha about “The Wall”, you need to understand two things. First, a bit about the Mexico – United States border, or the Southwest Border that runs from San Diego/Tijuana on the Pacific Ocean to Brownsville, Texas on the Gulf of Mexico. And second, the need for, design of, and installation of a Southwest Border fence was determined just a few short years ago with the Secure Fences Act of 2006. First, the Southwest Border is really two different borders, both geographically and politically. The first third or about 700 miles runs from the Pacific Coast in a series of straight lines: from San Diego to the Colorado River at Yuma, Arizona; 20+ miles down the Colorado River; southeast to Nogales; east-southeast into New Mexico where it jogs north, then east to El Paso/Ciudad Juarez. The second part of the Southwest Border then follows the middle (technically, the deepest channel) of the Rio Grande River about 1,260 miles. Currently (early 2019), there are various types of fencing – primary pedestrian and vehicle fencing being the two most common – along 650 of the 1,954 miles of the Southwest Border. This is shown in the image below. In 1907 President Ted Roosevelt signed what became known as the “Roosevelt Reservation”, which created a 60 foot buffer on the US side of the US/Mexico border in most of California, Arizona, and New Mexico. He was able to do so because the land along the border was federal land (there were a few places that had been in private hands before these states joined the Union that were essentially grandfathered or exempted from the Roosevelt Reservation). But the 60-foot buffer did not apply to any land in Texas, because Texas had retained title to all land before it became a state. The result is critical: although the US Government needs to get permission to traverse private land to get to the border, it owns that border land and can build fencing or a wall without seizing (and compensating) private land owners. That is not the case in Texas, where eminent domain challenges have become common – and expensive and time consuming – when it comes to building a border wall. In 2005 President Bush launched the Secure Border Initiative to enhance the security at ports of entry and along the ~2,000 mile US Mexico and ~5,500 mile US Canada borders. The enhancements ran the gamut: from more personnel to new technologies, infrastructure, and fencing. At the time of the Secure Fence Act of 2006, there was about 110 miles of existing walls or fencing. The Department of Homeland Security determined that a total of about 670 miles of fencing was “most practical and effective”, and that they could build another 260 miles of vehicle walls or barriers and 290 miles of “primary pedestrian” fencing, at a total cost of $2.3 billion. 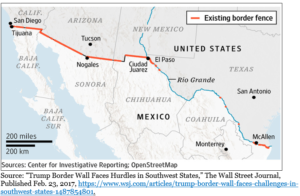 Essentially, what DHS determined was that they could fill in the rural and urban gaps in the ~700 miles of overland border from California across Arizona and New Mexico (leaving some gaps in the “remote” sections), and fence the urban and border crossing areas of the ~1,260 miles along the Rio Grande River from El Paso to the Gulf of Mexico. They determined that installing fencing along most of the Rio Grande River border was either impractical or ineffective. By 2007 the DHS had established a Fence Lab at Texas A&M University to test and determine how to build the various types of walls or fencing, and where and how to install it. The DHS was given until December 31, 2008 to design, test, and install the ~550 miles of new fencing. The budgets for the Secure Border Initiative – which included the new fencing – were set at $1.5 billion for Fiscal Year 2007, $1.225 billion for FY 2008, and $775 million for FY 2009. A DHS Office of Inspector General Report from April 2009 (OIG-09-56) titled “Progress in Addressing Secure Border Initiative Operational Requirements and Constructing the Southwest Border Fence” found that DHS was only 55% finished constructing the pedestrian fencing (making up 370 of the total of 670 miles of fencing) and 51% finished constructing the vehicle fencing (300 miles). It noted four other interesting things: first, none of the nine approved fence prototypes were made of concrete. Second, the delays were caused, in part, from the eminent domain cases in federal court in Texas, of which there were an estimated 300. Third, the original cost estimates were much too low. And fourth, the cost of civilian contractors building and installing the fencing was as much as four times as the costs if the military built and installed the fencing. Note that all 548 miles of new fencing (and a total of 670 miles of fencing) was completed by 2010. The OIG report is at https://www.oig.dhs.gov/assets/Mgmt/OIG_09-56_Apr09.pdf. In summary, there is currently ~650 miles of fencing along the ~1,950 mile Southwest Border. Most of that – about 550 miles – was built between 2007 and 2010 as a result of the Secure Fences Act of 2006 and a recommendation from the Department of Homeland Security that 670 miles of fence was “most practical and effective.” In February 2018 the Department of Homeland Security, in response to the President’s proposed budget, stated that they needed $1.6 billion to support the construction of 65 miles of new border wall system. See, https://www.dhs.gov/news/2018/02/12/department-homeland-security-statement-president-s-fiscal-year-2019-budget. In conclusion, I offer no conclusion. 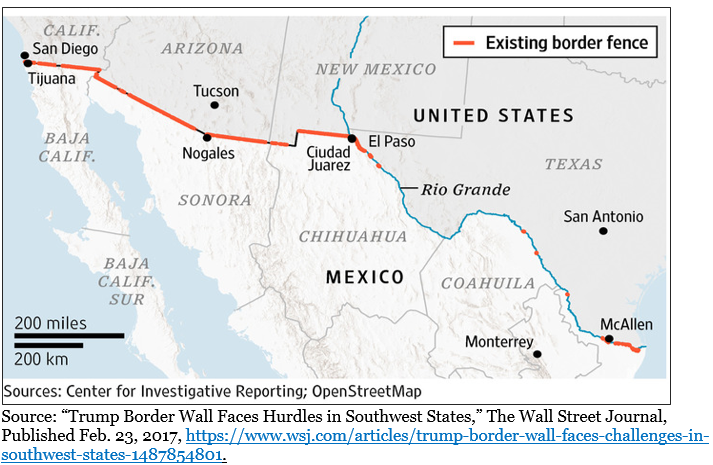 Rather, I trust that this information provides you with some information to form your own conclusions as the debate continues in Washington DC and on Twitter and cable news about the need to build (and pay for) more fencing or walls along the Southwest Border. 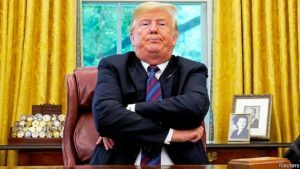 President Donald J. Trump – Will Congress ever present him with a cannabis bill or bills to sign? So former AG Sessions has stated that he “rejects the idea that America will be a better place if marijuana is sold in every corner store” and the presumptive AG Barr has said “I think it’s a mistake to back off marijuana”. AG Sessions didn’t take any action, and presumptive AG Barr seems reluctant to do so. So where does that leave the cannabis and financial services industries? I believe they are still in limbo, waiting for Congress to pass, and the President to enact, federal legislation that will pave the way for regulations and regulatory guidance that will truly open up banking services to cannabis related businesses. But it will take time, as there is always “regulatory lag” between new legislation being passed, regulations being written, and regulatory guidance being published. And then it takes even longer for financial institutions to implement those regulatory changes: to build programs, write policies, implement new technologies, etc. So even if Congress acted today, financial institutions won’t have a clear path forward for (at least) a couple of years. Until then, we will remain in limbo, not knowing whether, how, or when financial regulators or prosecutors could pounce on a bank or credit union. Let’s take a look at how we got to the state of limbo. Let’s go back and take a look at the now-famous Cole Memo guidance and, more importantly, former AG Sessions’ apparent rescission of that guidance. It is those two things that are driving the discussion on whether and how financial institutions can provide banking services to marijuana related businesses. In January 2018, Attorney General Sessions “revoked Obama-era guidance that had effectuated a hands-off approach to state-legalized cannabis businesses.” This quote from an online National Law Journal article (see https://www.law.com/nationallawjournal/2018/09/11/feds-should-be-banging-the-drum-the-loudest-for-cannabis-industry-banking/?slreturn=20180812164053) and others like it, have been used by both (all?) sides of the marijuana argument currently embroiling America. But what, exactly, did AG Sessions revoke? Was there a “hands-off approach” by the Feds to state-legalized cannabis businesses? And what does the Sessions memo do, if anything, for financial institutions looking to provide services to marijuana-related businesses? If there are answers to those questions, we need to first go back almost 10 years to the first DOJ memo on marijuana. But an interim stop is warranted, to March 2017 with President Trump’s Executive Order 13777 calling for federal agencies to establish Regulatory Reform Task Forces to identify regulations for potential repeal, replacement, or modification. At that time the President, and (fairly) some others felt that American society was over-regulated. It was time to take a look at all the regulations, and repeal, replace, or modify those that were out-dated, redundant, inefficient, or simply bad. In response, the Department of Justice formed a task force and began its work identifying regulations, rules, and anything that looked like and acted like a regulation or rule. “Today, in an action to further uphold the rule of law in the executive branch, Attorney General Jeff Sessions issued a memo prohibiting the Department of Justice from issuing guidance documents that have the effect of adopting new regulatory requirements or amending the law. The memo prevents the Department of Justice from evading required rulemaking processes by using guidance memos to create de facto regulations. In the past, the Department of Justice and other agencies have blurred the distinction between regulations and guidance documents. Under the Attorney General’s memo, the Department may no longer issue guidance documents that purport to create rights or obligations binding on persons or entities outside the Executive Branch. On December 21, 2017 the DOJ announced that “pursuant to Executive Order 13777 and [AG Sessions’] November memorandum prohibiting certain guidance documents, he is rescinding 25 such documents that were unnecessary, inconsistent with existing law, or otherwise improper.” None of the “marijuana memos” were on the list of twenty-five. Ogden Memo – October 19, 2009: David W. Ogden, Deputy Attorney General, “Memorandum for Selected United States Attorneys: Investigations and Prosecutions in States Authorizing the Medical Use of Marijuana”. This was issued at a time when only a handful of states were embarking on early medical marijuana programs. Cole II – August 29, 2013: “Memorandum for All United States Attorneys: Guidance Regarding Marijuana Enforcement”. Note that Cole II set out the eight enforcement priorities that were picked up in FinCEN’s February 14, 2014 Guidance (see below), but it said nothing about financial institutions, financial crimes, or the Bank Secrecy Act. Cole III – February 14, 2014: “Memorandum for All United States Attorneys: Guidance Regarding Marijuana Related Financial Crimes”. The title of this memo is important: unlike Cole I, Cole II brought in marijuana related financial crimes, the obligations of financial institutions, and the specter of those institutions violating federal law by knowingly providing services to marijuana-related businesses. In fact, Cole II noted that the Cole I guidance “did not specifically address what, if any, impact it would have on certain financial crimes for which marijuana-related conduct is a predicate.” Cole II addressed those impacts. Wilkinson Memo – October 28, 2014: Monty Wilkinson, Director of the Executive Office for U.S. Attorneys, “Policy Statement Regarding Marijuana Issues in Indian Country”. Cole III needs to be read with the FinCEN Guidance issued the same (Valentine’s) day. I won’t repeat the FinCEN Guidance here (you can find it here https://www.fincen.gov/resources/statutes-regulations/guidance/bsa-expectations-regarding-marijuana-related-businesses) but its authors intended that it “clarifies how financial institutions can provide services to marijuana-related businesses consistent with their BSA obligations.” The FinCEN Guidance heavily relied on and quoted the Cole II eight priorities, and set out requirements for risk assessments, customer due diligence (seven distinct requirements), a requirement that “financial institutions should consider whether a marijuana-related business implicates a Cole priority or violates state law, twenty-five “red flags” for monitoring and surveillance of marijuana-related businesses, and how to (and shall) file Suspicious Activity Reports on every marijuana-related business customer, regardless of whether their activity is suspicious or not. It is important to note that, almost five years after that guidance was published, 95%+ of financial institutions have interpreted that to mean they cannot knowingly, actively provide services to marijuana-related businesses and meet their BSA obligations. But back to Attorney General Sessions and his “rescission of the Cole memo”. The terse title of his memo sends a clear message: “Marijuana Enforcement”. It was not titled “Managing Competing State and Federal Obligations In A Way That Advances The Positives Aspects of Marijuana Reform While Addressing Possible Negative Societal and Economic Harm”. Attorney General Sessions’ intent was clear from the outset: it was about enforcement. Who was AG Sessions thinking about when he wrote his “Marijuana Enforcement” memo? He directed that enforcement at banks, credit unions, and money remitters, among others. His memo began with a statement about the “significant penalties” for the “serious crimes” of cultivating, distributing, and possessing the “dangerous drug” marijuana in violation of the Controlled Substances Act. He then stated that these activities “also may serve as the basis for the prosecution of other crimes”, and he listed three such crimes: (1) those prohibited by the money laundering statutes under Title 18, sections 1956 and 1957; (2) the unlicensed money transmitter statute under Title 18, section 1960; and (3) the Bank Secrecy Act under Title 31, section 5318. For banks, section 5318 of Title 31 is the “program” requirement: section 5318(h) provides that “in order to guard against money laundering through financial institutions, each financial institution shall establish anti-money laundering programs …”. Failure to have an effective program or being found to have a program that doesn’t contain all the necessary “pillars” or attributes required, can result in billion-dollar fines and penalties. Knowingly providing banking services to marijuana-related businesses can expose banks to program violations. The result? As written above, five years after the FinCEN guidance, and without having received any written guidance from their regulators, 95%+ of financial institutions have interpreted the FinCEN guidance and Sessions’ rescission of the Cole Memo to mean they cannot knowingly, actively provide services to marijuana-related businesses and meet their BSA obligations. “No, it didn’t do that, did it? … It seems to me that the DOJ and guideline people are just saying, well, maybe we can put our head in the sand and this will go away.” (Transcript of hearing, page 3). And later in the same hearing, Judge Jackson stated: “But in [the credit union’s] brief, in black and white, you say the FinCEN guidance authorizes banks to serve marijuana related businesses. I don’t agree with you. I don’t think it does.” (Transcript, page 63). And as recently as January 17, 2019, OCC Comptroller Joseph Otting told reporters that Congress has “to act at the national level to legalize marijuana if they want those entities involved in that business to utilize the US banking system” and that he “hopes for resolution to marijuana banking issues in 2020” (quoting a PoliticoPro tweet). The Treasury Inspector General’s challenge to FinCEN to provide clarity to financial institutions must be taken up by FinCEN and the banking regulators. Unless and until the financial services industry gets clear, unequivocal, consistent, written laws, regulations, and guidance from Congress, Treasury, and Justice to provide banking services to marijuana-related businesses, it will and should do what it is currently doing – balancing the undue risks against the insufficient rewards – and continue to stand on the sidelines while our communities, veterans, patients, doctors, caregivers, and others suffer. Congressional and Executive Branch compassion without the necessary collaboration and courage to act will not resolve this crisis. FinCEN’s SAR data suggests that ~485 of the ~12,000, or about 4% of, US credit unions and banks are providing financial services to marijuana-related businesses. The number of credit unions has been steady over the last three years at about 110; the number of banks has slowly risen to about 385. IT remains unknown how many of those 485 are actively banking MRBs, where they have assessed the risks, accepted the risks, and built a program to manage the risks.